Jhulan Yatra is a swing festival observed in the month of Shravan Month (July – August) and is dedicated to Lord Krishna and Lord Jagannath. Jhulan Yatra 2019 date is from August 11 to August 15. It is of great importance in Vrindavan, Lord Jagannath Temples, ISKCON and Mayapur. The festival begins on the 11th day of the Shukla Paksha (waxing phase of moon) in Shravan month and ends on Shravan Poornima (full moon). Jhulan Yatra festival is inspired from Lord Krishna’s pastimes in Vrindavan. It is believed that Lord Krishna, Radha and other Gopis and Gopas used to swing in the monsoon season in Vrindavan. How is Jhulan Yatra Observed? Jhulan Yatra is Lord Krishna’s swing festival and on this day devotees place an idol of Krishna or Lord Jagannath on a lavishly decorated swing. The swinging of the Lord is accompanied by dance and music. 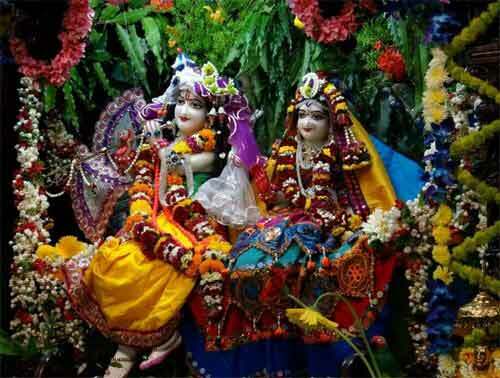 In Vrindavan and in ISKCON temples, an idol of Goddess Radha is also placed along with Krishna. Jhulan Yatra festival is observed only for a day in majority of temples. In some temples, it is observed on all five days from Ekadashi to Purnima. The festival is also a major event in ISKCON Temples. The festival is not a mere ritual but a message from Lord Krishna to be with Nature. To enjoy the seasons – swing on a swing in the cool breeze of monsoon. The only way to understand Krishna is by understanding Mother Nature. A similar festival is observed by Lord Swaminarayan sect from Ashad Purnima to Shravan Poornima and is known as Hindola.